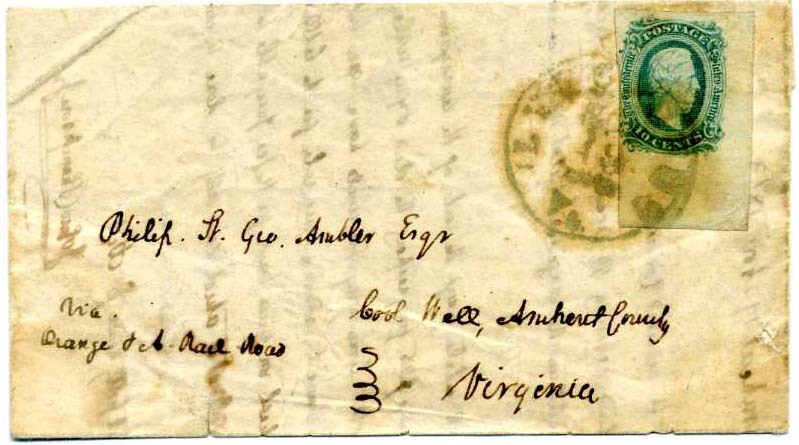 CSA 11, 10¢ blue with 4 huge margins tied neat clear CHARLOTTESVILLE / VA . // OCT /3 / 1863 cds to "Dr. Geo. W. Archer, Hospital Montgomery White Sulphur Springs, Montgomery County, Virginia" (a resort before and after the war) on a clean superb homemade cover. CSA 11-KBd, 4-margin 10¢ deep blue with manuscript "Chester Va., Mar 7/65", a very late use on a homemade cover, only one month from surrender. 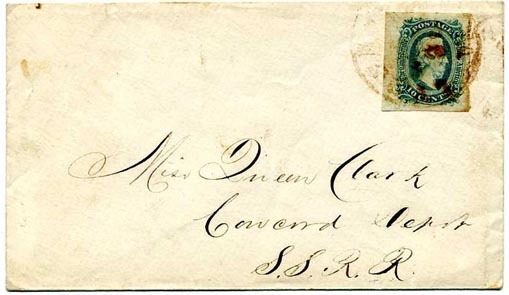 CSA 11, large 4-margin 10¢ blue tied by red or brown (you decide - recorded both ways) LYNCHBURG / VA. cds on neat commercial cover addressed to "Miss Queen Clark, Concord Depot, S.S.R.R. (South Side Railroad); back flap with embossed Star-of-David. The Southside Railroad connected City Point, a port on the James River, with the farm country south and west of Petersburg, Virginia to Lynchburg, Virginia, a distance of about 132 miles. It was very important to the Confederacy during the War. 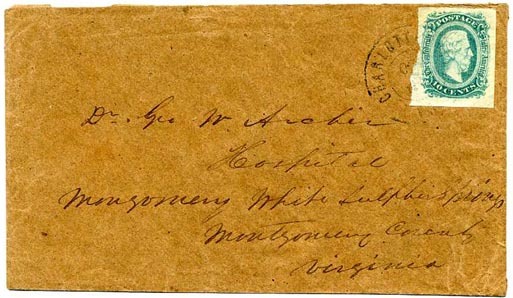 CSA 11, pencil canceled 10¢ blue with matching cancellation of "Arrington, Va. 29 June 1864" on small adversity cover made from military form and addressed to "Capt. 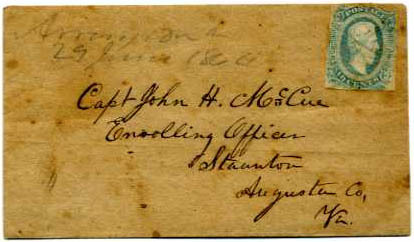 John H. McCue, Enrolling Officer, Staunton, Augusta Co., Va.". Stamp has pre-printing paper fold. 2000 CSA Certificate #363. $180. 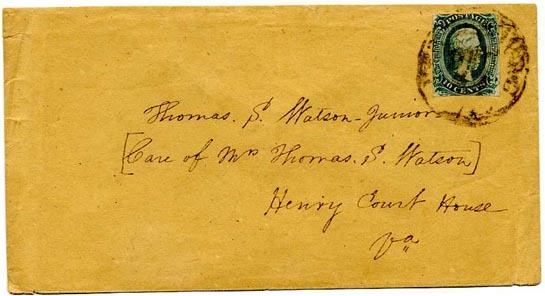 John Howard McCue's father was a prominent Whig judge and attorney in Staunton. His cousin, John Marshall McCue, was also active in politics and the law. McCue's great grandfather emigrated from Ireland to Lancaster County, Pennsylvania, and moved eventually to Nelson County, Virginia. McCue came from a family of ministers and lawyers; he chose the law as his vocation. McCue practiced law in Nelson County in Lovingston, just over the mountain from Staunton. His family connections and law practice carried him often to Augusta. He was appointed commissary of the 51st Virginia in 1861 and served through the war. He was a frequent correspondent of CSA Brig. Gen. John D. Imboden, also of Staunton. 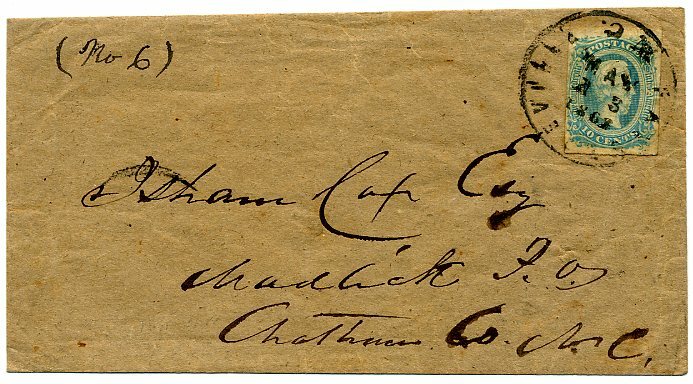 CSA 11-AD, right sheet margin of 10¢ blue tied by neat CHARLESTON / S.C. // OCT / 6 cds on cover "in care of Abner I. Shuler, Target Club", Very Fine. 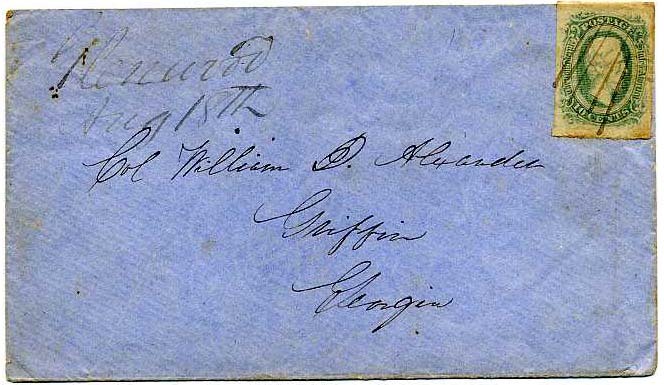 CSA 11, 4-margin 10¢ blue with small faults tied bold blue COLUMBIA / S.C. cds on adversity cover made from printed court document, Showy. CSA 11-ADa, 10¢ milky blue right sheet margin tied KINSTON / N.C. cds on pale pink cover to "Miss Kate F. Curtis, Hillsborough, N.C." Kate was the daughter of Rev. Moses Ashley Curtis, an Episcopal priest from Hillsboro who was a preeminent mycologist renowned among botanists. 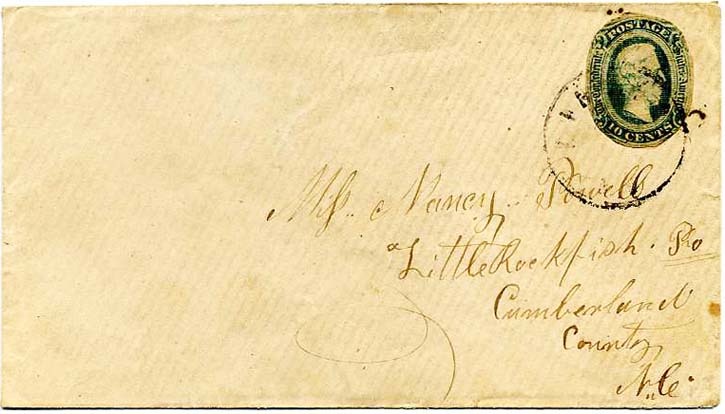 CSA 11, 10¢ blue, 4 margins, tied KINSTON / N.C. cds on turned cover to "Miss Kate F. Curtis, Orange County Hillsboro, N. Carolina" Kate was the daughter of Rev. 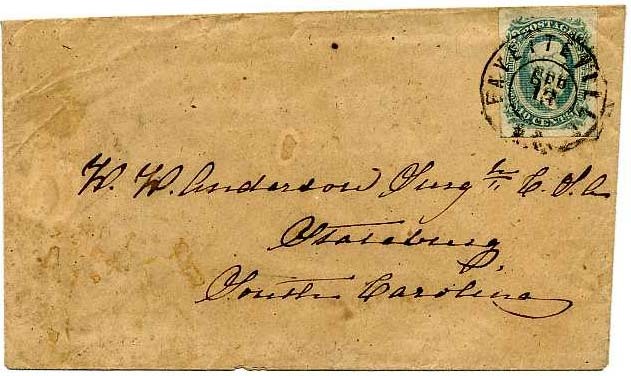 Moses Ashley Curtis, an Episcopal priest who was a preeminent mycologist renowned among botanists even today; inside use bears no stamps but a neat blue HILLSBORO/N.C./JUL/19 double circle and manuscript "Paid" addressed to Kate's brother "J(ohn) H. Curtis, Orange Light Artillery, Kinston, N.C." Curtis was mustered into Company "G" of the 3rd N.C. Light Artillery on March 11, 1862 and then transferred into Company "E" of the 13th N.C. Battalion Light Artillery along with his brother, M.A. Custis, Jr. He rose in the ranks from private to 1st Sergt. Co. E - Captain Henry Dickson's Battery. 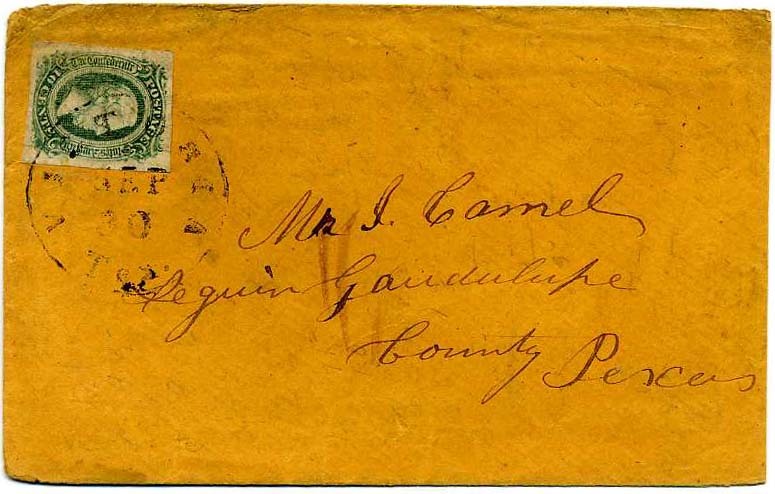 CSA 11-ADa, 10¢ milky blue tied FORT GAINES / Ga ./ JUL / 30 cds on cover sent to "Mrs. Sam'l M. Castle, Milledgeville, Georgia" Upon arrival, it was forwarded with a manuscript "For'd Due 10" to Spring Place with MILLEDGEVILLE/Ga. cds. Excellent condition. 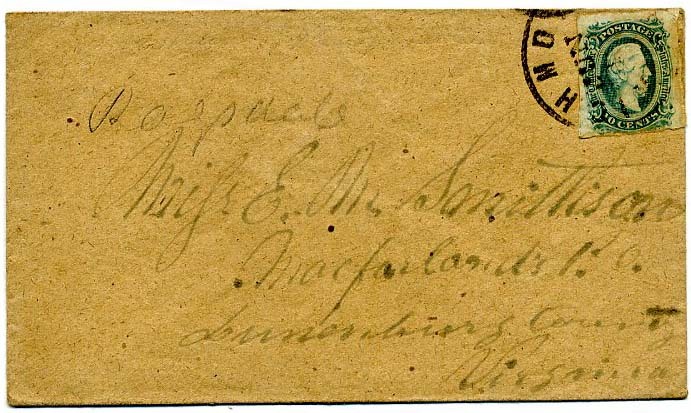 A second uncanceled 10¢ blue CSA 11 seals the back flap which has opening tears. Rare small town usage and very nice forwarded use. 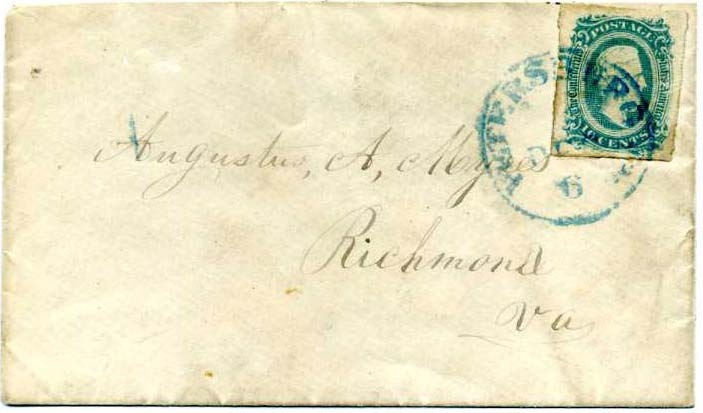 CSA 11, 10¢ blue tied RICHMOND / VA. // JUN / 1 cds on pristine homemade cover to "Miss E.M. Smithison (sic), MacFarland's P.O., Lunenburg County, Virginia"
CSA 11-AD, 4-margin almost milky blue shade tied CHARLESTON / S. C. June double circle cancel on cover addressed to "Miss Margaret Moultrie, Camden, So. Ca." The Moultrie family was one of the premiere SC families since revolutionary war days. A superb stamp on a pristine homemade cover, ex-Powell. 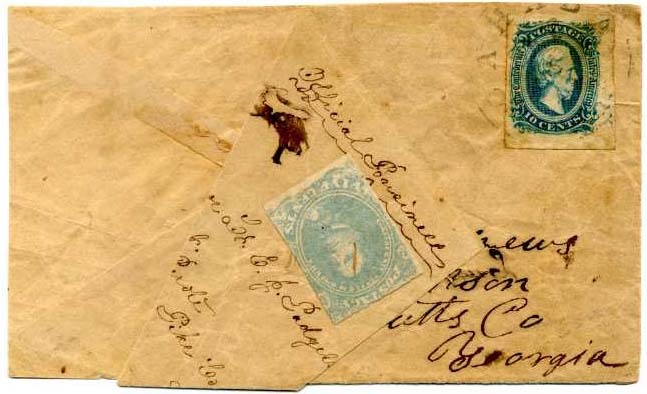 CSA 11, 10¢ light blue approaching milky blue shade, 4 nice full margins, tied bold neat RICHMOND / Va. / JAN / 31 cds on pristine cover addressed to “Col. 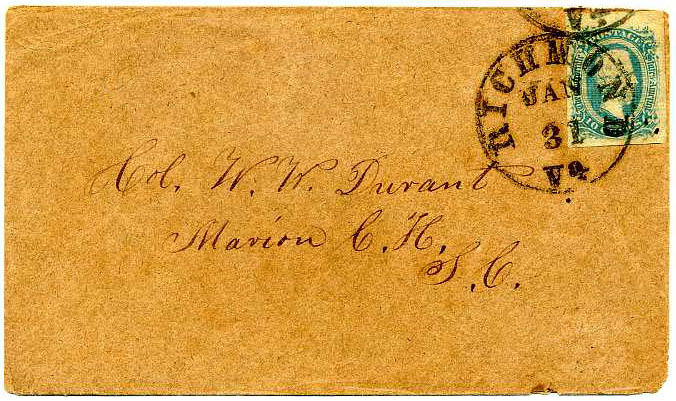 W. W. Durant, Marion C.H., S.C.”. Extremely Fine. Found no military record of a Col. Durant, only non-commissioned soldiers although many from S.C. Further research by you might yield something. 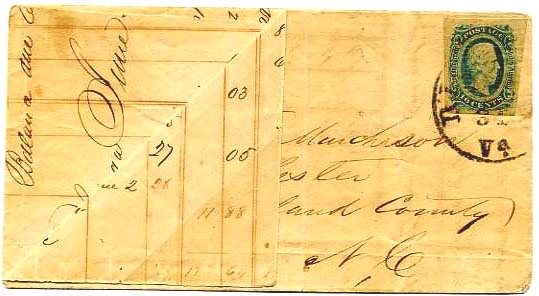 CSA 11-AD, 10¢ blue tied NEW MARKET / VA // MAY / 19 on adversity cover fashioned from “Consolidated Provisions” printed form listing coffee, sugar, tea, etc. Addressed to “Mrs. Mary L. Lupton, Bridgewater, Rockingham Co., Va.” Most attractive use. 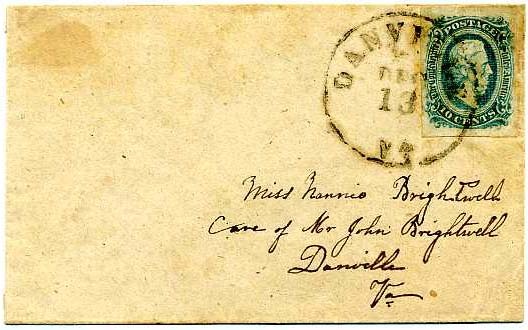 CSA 11, 10¢ blue, four margins, tied DANVILLE / VA // DEC / 13 cds on small homemade cover to “Miss Nannie Brightwell Care of Mr. John Brightwell, Danville, Va." Nice overpaid drop use. Such overpaid drop uses are often seen when a soldier gave the letter to a friend to drop in the mail. 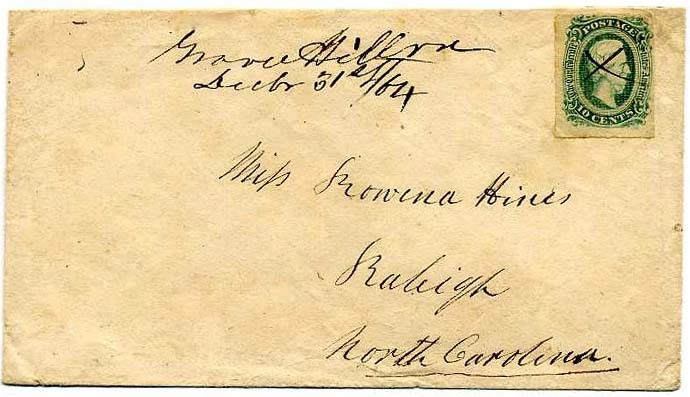 Nannie H. Brightwell, age 18, daughter of John S. and Sarah Brightwell, married Jessee S. Bennett, age 21(farmer), on 14 December 1865. 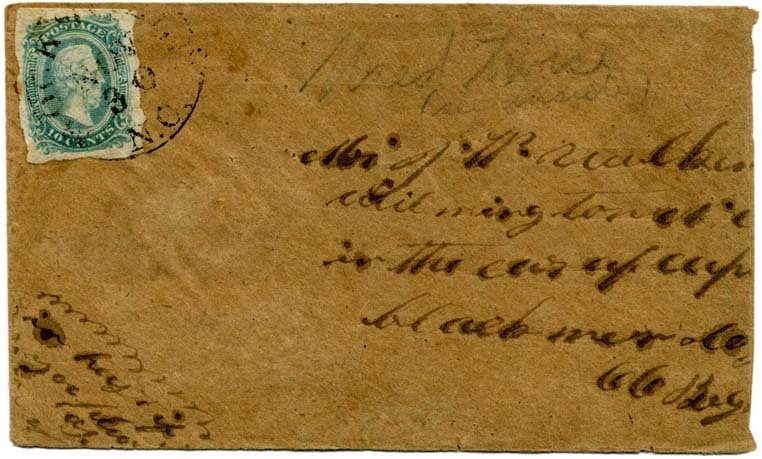 It could be speculated that Nannie's soldier beau mailed her such a missive. $180. 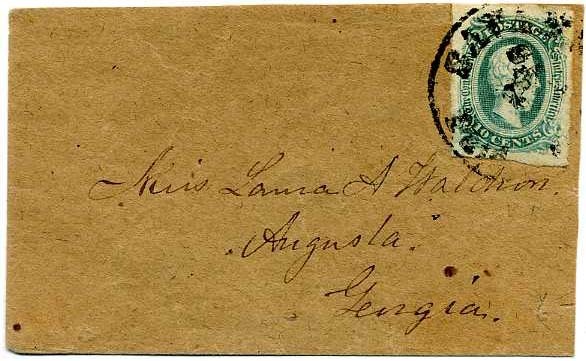 CSA 11-ADa, 10¢ light blue approaching milky shade tied MACON / GA. double circle cancel on homemade cover to “Capt. 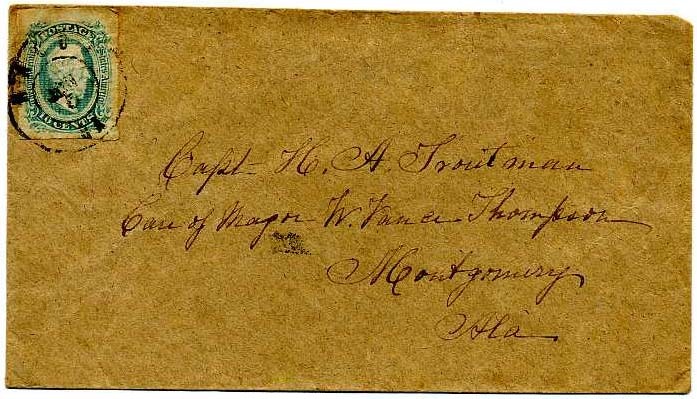 H. A. Troutman, Care of Major W. Vance Thompson, Montgomery, Ala”, bit of top back flap missing. There are two H. A. Troutman listings in military records, both from Georgia and could well be the same person although both shown at privates. A simple Google search shows Capt. H. A. Troutman in the Macon Light Artillery – formerly Napier Artillery (sometimes Google is better than the official records!) Slaten's Company, Georgia Artillery (Macon Light Artillery) history included. CSA 11, 10¢ blue, 4 large margins all around used on small neat cover by Moors Ord(inar)y Va June 11 to “Capt Richard H. Watkins, 3rd Va Cavalry 2nd Brigade, Richmond, Va.” Military bio included. 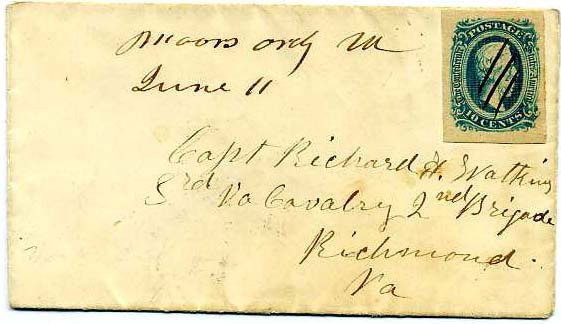 Richard Henry Watkins rose from private to captain by 1862, was wounded at Mountsville Va with bad saber cut to the head, wounded in the left hand at Tom’s Brook, Va and eventually paroled May 12, 1865 in Danville, Va, Ex Tobias. 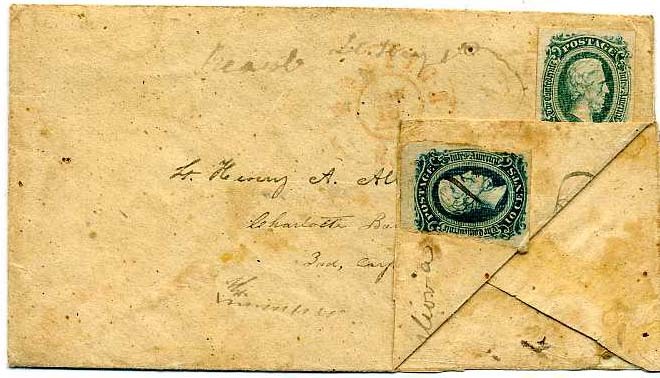 CSA 11-ADc, 10¢ greenish blue tied light red RALEIGH / N.C. with second strike at left on turned cover addressed to “Lt. 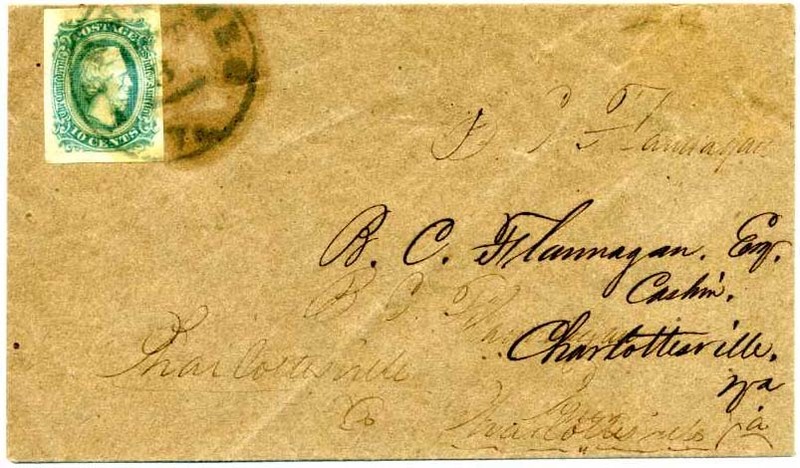 Henry A. Albright, Charlotte Battery Poague’s Battalion, 3rd Corps Northern Army of Va” with light difficult to decipher note at top “Mail Lt. ? 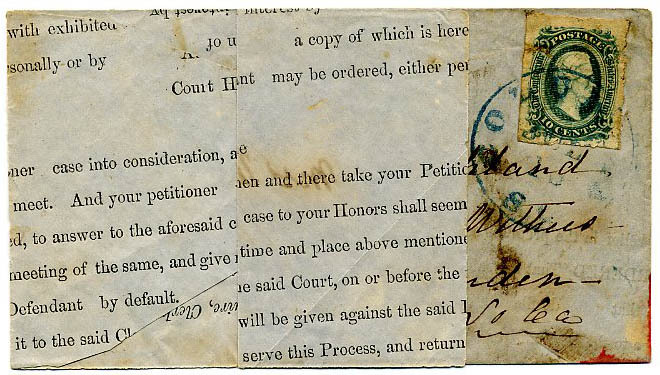 ?”; inside use CSA 12, 10¢ blue of different shade used with manuscript cancel of Bentivoglio (Va) to “Eleber Joseph Albright, Moffitts Mills PO, Randolph County, North Carolina”. Ex-Tobias. Military bio enclosed. Henry C. Albright (different middle initial but proper company) enlisted at 18 years old as a 3rd Lieut and rose to Capt in Co. G NC 26th Infantry before he died of wounds sustained near Petersburg. A wonderful double use, Ex Tobias. 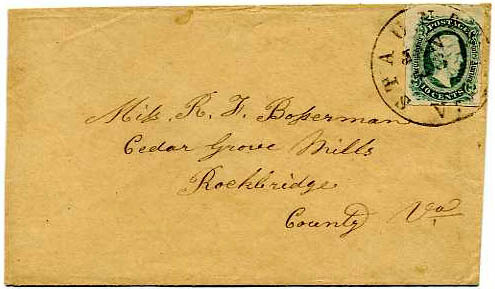 CSA 11-ADc, 10¢ greenish blue tied manuscript cancel of Cedar Fork, Va ApriL 3 1864 on fresh homemade turned cover to Richmond; inside use CSA #7, 5¢ blue with manuscript cancel of Milford, Va. (rarity 7) Feby 28 addressed to Cedar Fork, Ex-Tobias. Open 3 sides to display and small tape stain at edge nicely hidden under upturn of cover. Scarce double manuscript towns. 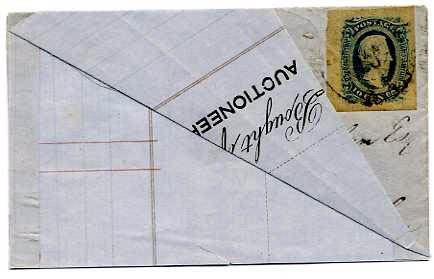 CSA 11, cut to shape 10¢ blue used on homemade cover with Columbia, Va Feby 11 manuscript cancel to “Mrs. Geo Wm White, Sturgeonville, Brunswick Co, Va”, Ex Tobias. 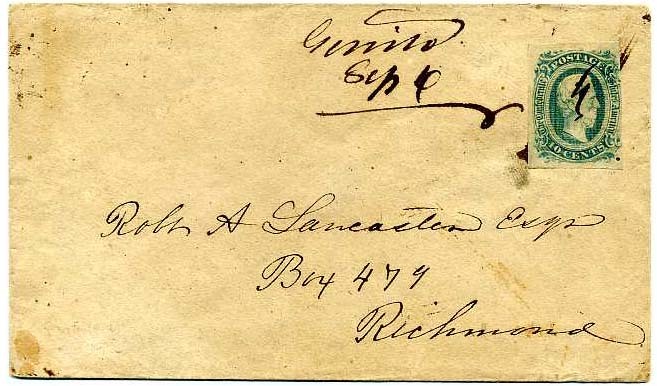 CSA 11, 10¢ blue used on homemade cover with manuscript cancel of Genito (Va.) Sep 6 to “Robert A. Lancaster Esq Box 479, Richmond (Va)”, Ex Tobias. 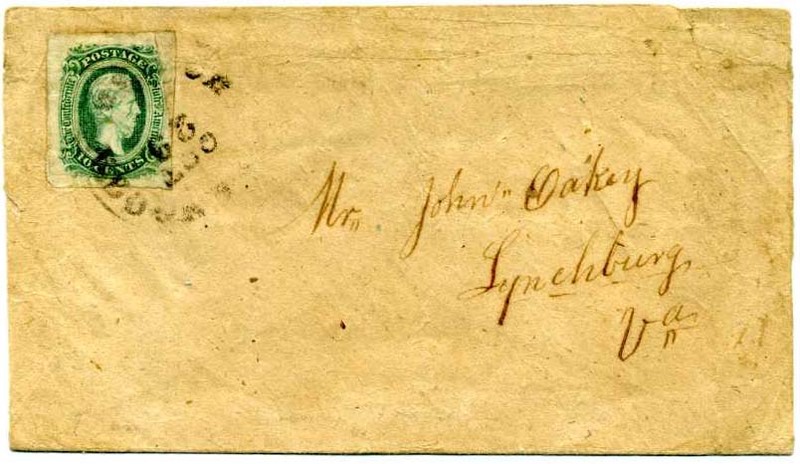 CSA 11c, 10¢ greenish blue used on cover with Gravel Hill Va Decbr 31st / 64 manuscript cancel to Raleigh, Ex Tobias. 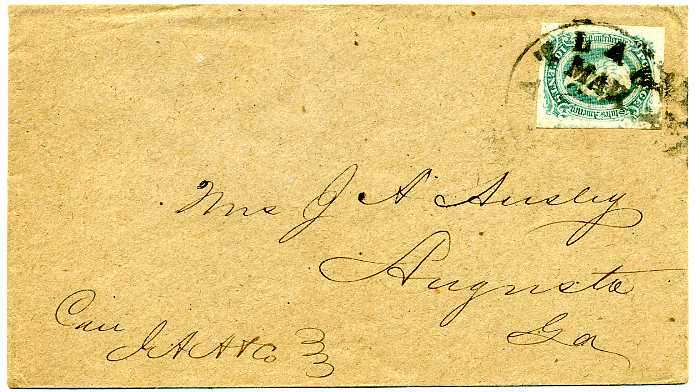 CSA 11-AD, 10¢ blue tied by blue PETERSBURG / Va. cds on cover to Argus PO, Ala(bama), Ex Tobias. CSA 11-ADd, 10¢ green tied RICHMOND /VA cds on cover; light file fold down center; 2000 CSA Certificate #03897. 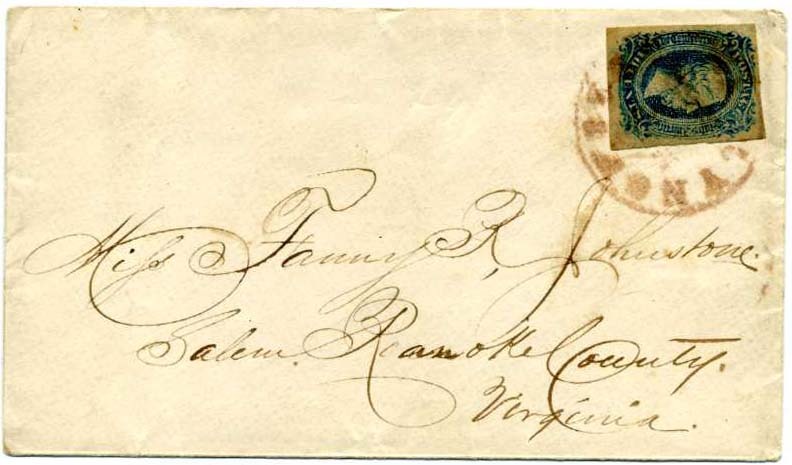 Very scarce shade, particularly on cover and authenticated. CSA 11, 10¢ blue with four large even margins, tied on cover by neat FAYETTEVILLE / N.C. / SEP / 13 double circle cancel on pristine homemade cover to “W. W. Anderson Surg(eo)n C.S.A., Statesburg, South Carolina”. William W. Anderson was the Medical Director and Medical Field Inspector for the CSA in North and South Carolina; small photo included. 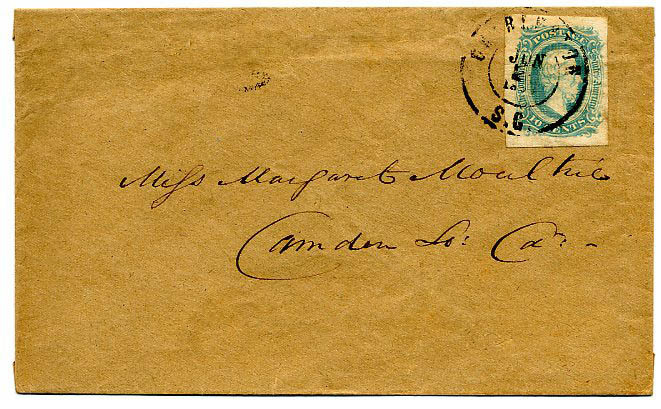 CSA 11, two 10¢ singles of different greenish shades on forwarded cover. First use is tied from bold JACKSONVILLE / Ga. // DEC / 12 cds on fresh cover addressed to Athens, Ga. which is crossed out and where second 10¢ stamp was applied and canceled ATHENS / Ga. CDS and redirected to Savannah, light file fold down the center otherwise very nice forwarded use. $350. 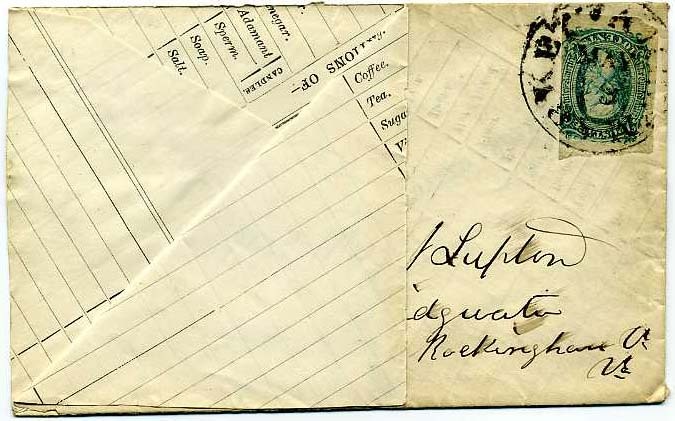 CSA 4b & 11, 5¢ light milky blue and 10¢ blue used on opposite sides of turned cover; #11 is a corner single tied by light CAHABA / Ala cds; and other side is manuscript “Official Business” (front almost completely separated from back) and addressed to “Lieut Wm H. Andrews or Lt. E. J. Padgett, 1st Ala Regiment, Perote, Pike Co Ala”. Not much info on Andrews in military records while Padgett shows as Elam James Padgett who enlisted as a 2nd Lt. in Co. G AL 1st Infantry. CSA 11, 10¢ blue, manuscript cancelled - likely a field usage - on adversity cover made from a weapons accounting form, addressed to “Capt. Jno A. Cobb, Macon, Georgia” with notation “If absent, L. or H. will please attend to contents” – that no doubt being “Lamar” or “Howell”. Howell Cobb served as president of the Confederate Provisional Congress (1861-62) and a major general of the Confederate army. 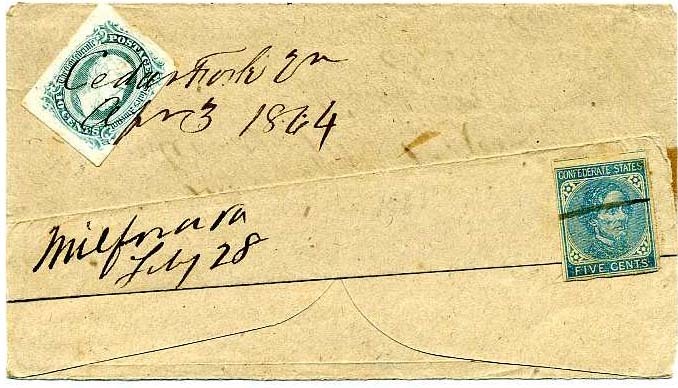 His personal history and correspondence is well-known. Nifty form itemizes swords, artillery, sabers, bayonets, musketoons, bayonet scabbards and more. 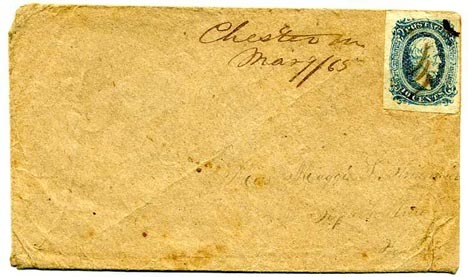 CSA 11, 10¢ blue, huge margins including bottom margin, tied by light strike of KINSTON, N.C. cds on immaculate cover, Extremely Fine, ex William A. Fox. CSA 11, 10¢ blue tied CHATTANOOGA / Ten. 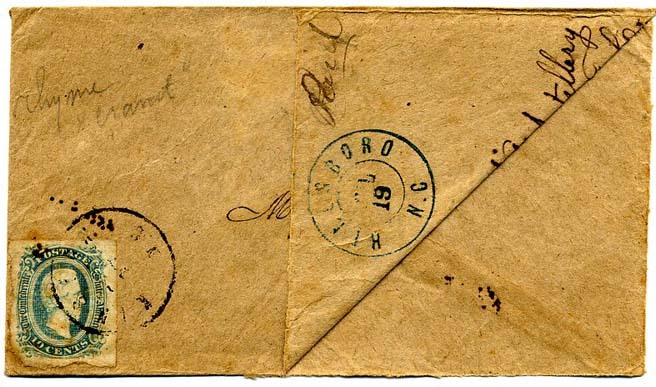 / NOV / 25 (1863) cds used as a field cancel from September 8, 1863 until January 24, 1864, docketed by “W(illiam). 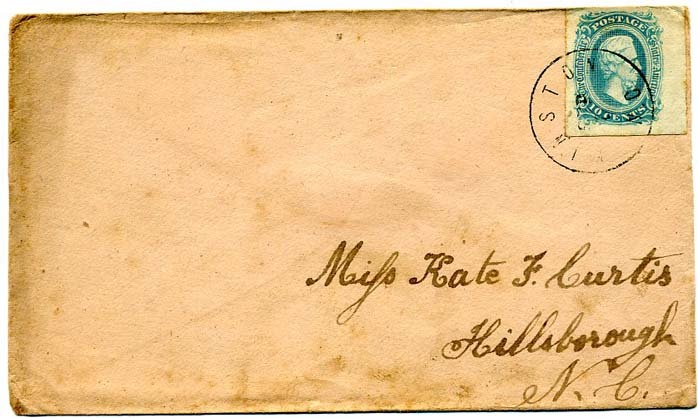 T. Windham, Co. K 37 Ala” – part of the Army of Tennessee - on homemade cover to “Mrs. 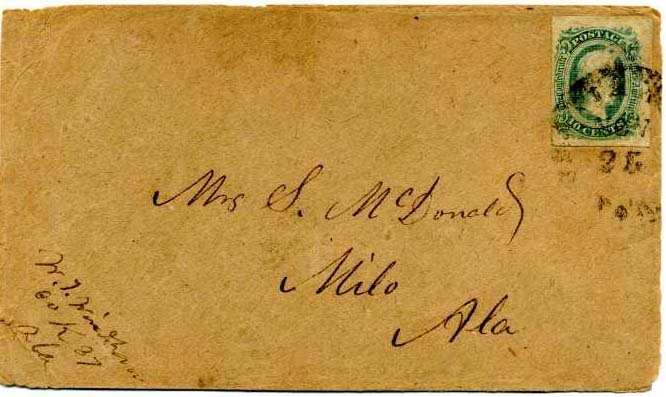 S. McDonald, Milo, Ala”. 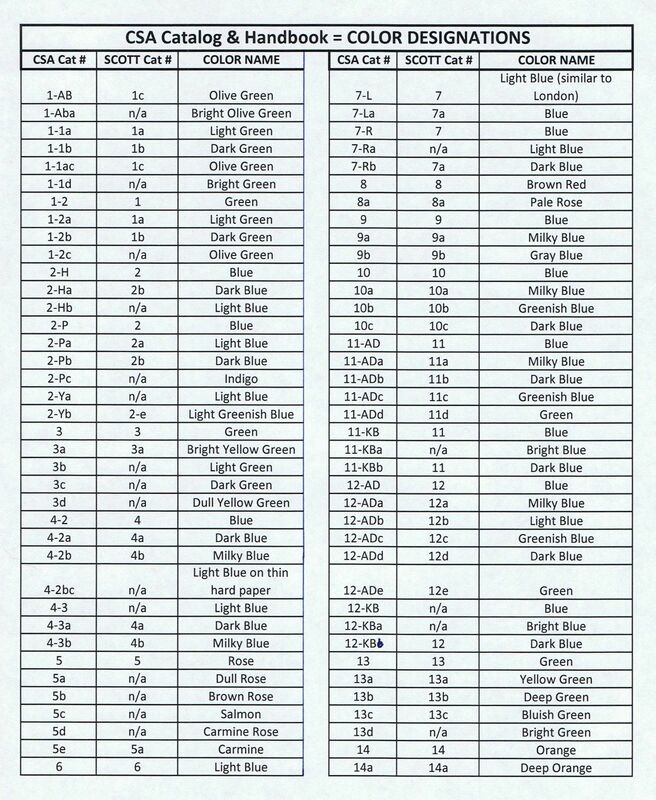 The 37th lost 121 out of 230 men engaged at Chickamauga September 19-20, 1863 and lost heavily at the Battle of Missionary Ridge, November 25, 1863. 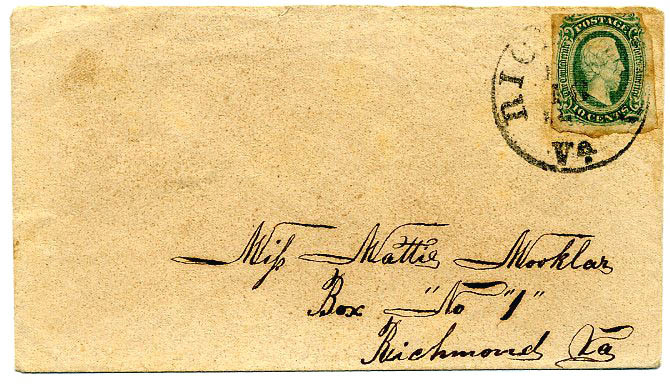 CSA 11, 10¢ blue left sheet margin copy with large margins all around, tied socked on the nose RICHMOND / VA. cds on turned cover addressed to “Miss Mary J. 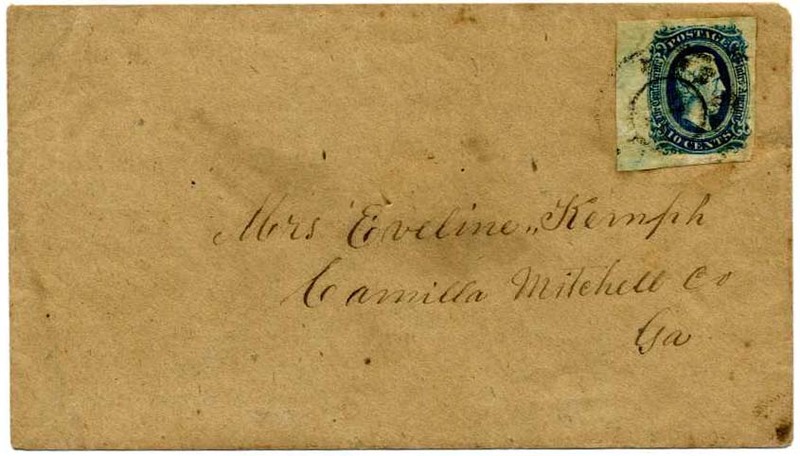 Person, Louisburg, Franklin Co, N. Carolina; inside use 10¢ greenish blue #12c used with manuscript Milford Va April 26 cancel to Louisburg, N. Carolina used on pre-addressed printed envelope to “Nunica, Ottawa Co, Mich” (crossed out); missing top and one side flap but a nice use. CSA 11, 10¢ blue with 4 large margins all around, tied socked-on-the-nose LOUISBURGH / N.C. cds on neat commercially made cover to “B.B. 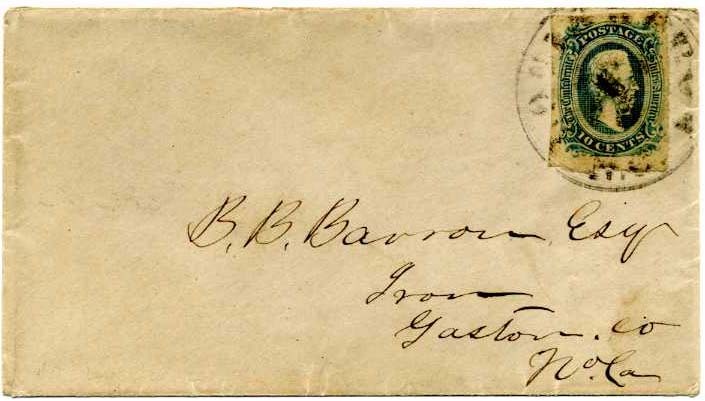 Baron Esq., Iron, Gaston Co., No., Ca.” Barron worked for High Shoals Iron Works, founded by Swiss-born John Fulenwider in about 1795, which ran through the War and remained operational until 1875. Iron was an enormous industry in NC and made thousands of tons of pig iron. 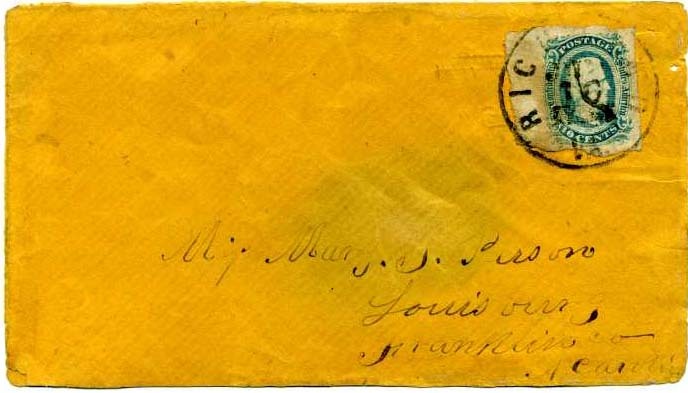 CSA 11a, 10¢ milky blue tied neat clear MACON / GA. // JUL / 11 cds on neat pristine commercially made envelope with embossing of PHLPS & SOLOMONS AGTS WASHINGTON D.C. under top back flap, addressed to “Mrs. Howell Cobb, Athens, Ga.” Howell Cobb served as president of the Confederate Provisional Congress (1861-62) and a major general of the Confederate army. His personal history is well-known and illustrious – bio accompanies. 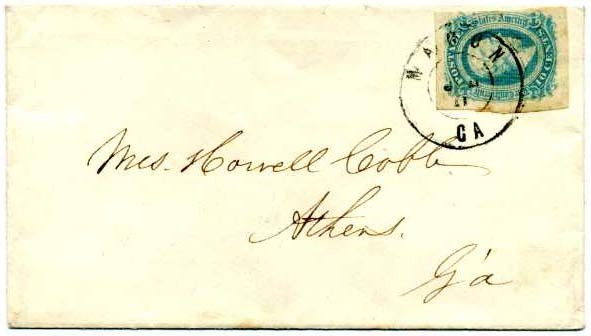 CSA 11, 10¢ blue tied ATHENS / Ga. / JUN / 14 (1864) cds on cover addressed to “Major Lamar Cobb, Gen Howell Cobb’s Staff, Macon, Georgia” with docketing “A.O. Cobb, Athens, Ga June 13th, 1864”. Major Lamar Cobb. 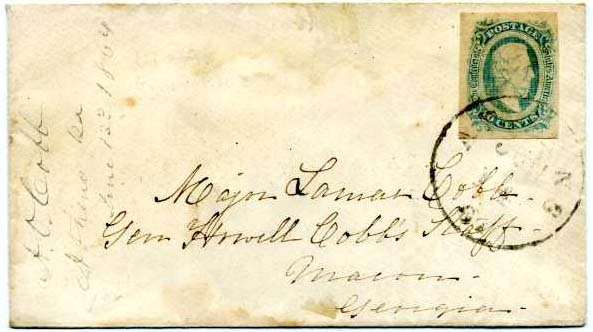 Lamar was a son of Howell Cobb (1815-1868) who married Mary Ann Lamar, daughter of Colonel Zachariah Lamar, of Milledgeville, Georgia, by whom he had 12 children. He became Speaker of the U.S. House of Representatives, Secretary of the Treasury under James Buchanan, President of the Provisional Congress of the Confederate States at Montgomery in 1861, and a Confederate Major General. 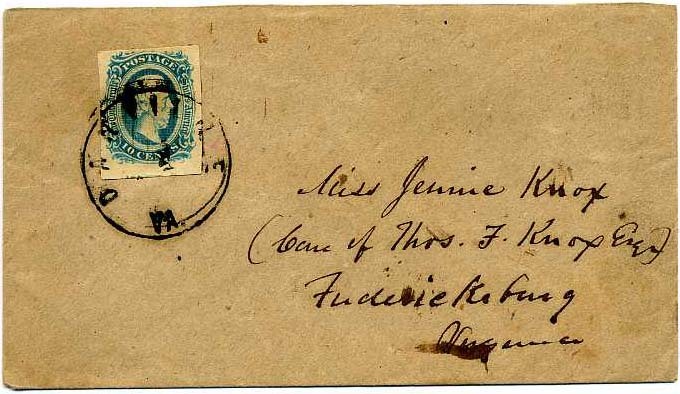 CSA 11, 10¢ blue tied RALEIGH / N.C. // DEC / 20 double circle cancel on small ladies cover with floral embossed flap tip. A charmer. 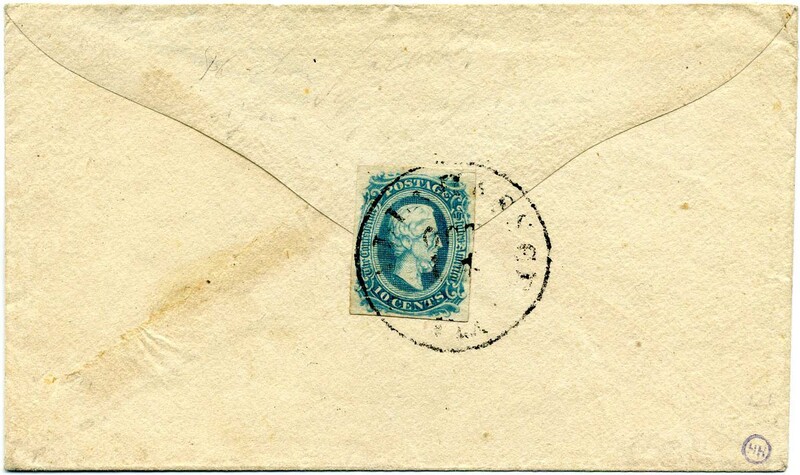 CSA 11-KB, 10¢ deep blue Keatinge & Ball printing with margins all around, tied by bold RALEIGH / N.C. double circle cancel on commercially made envelope with fancy “T.S.” embossed seal on top back flap, addressed “To Miss L.R. McCord, Columbia, S.C.” with the “T” of “To” in the shape of a heart. A charmer and scarce use of KB on cover which catalogs twice the AD, SCV for KB $200. CSA 11, 10¢ blue with large margins all around, tied neat blue PETERSBURG Va / DEC / 6 cds on cover to “Augustus A. Myers, Richmond, Va”; flap faults; Myers was a lawyer and the most prominent member of the Jewish community in Richmond with an illustrious career. CSA 11, 10¢ blue with large even margins all around, tied violet LYNCHBURG / VA. / OCT / 27 cds on homemade cover to “B.C. Flannagan, Esq., Cashier, Charlottesville, Va”, usual “greasy” cancel typical of the color cancels from this town, small part of flap missing, SCV $200. CSA 11-KB, 10¢ deep blue with four nice margins all around, tied brown LYNCHBURG / VA, cds on clean commercially made cover with Star of David embossed flap tip, addressed to “Miss Fanny R. Johnston, Salem Roanoke County Virginia”, much nicer than the usual “greasy” cancel typical of the color cancels from this town, SCV $260. Wonderful late use. CSA 11, 10¢ blue pair (pre-use creases) with four nice margins all around, tied double strike of RICHMOND / Va. // JUL / 17 cds on fresh homemade cover to “Mrs. 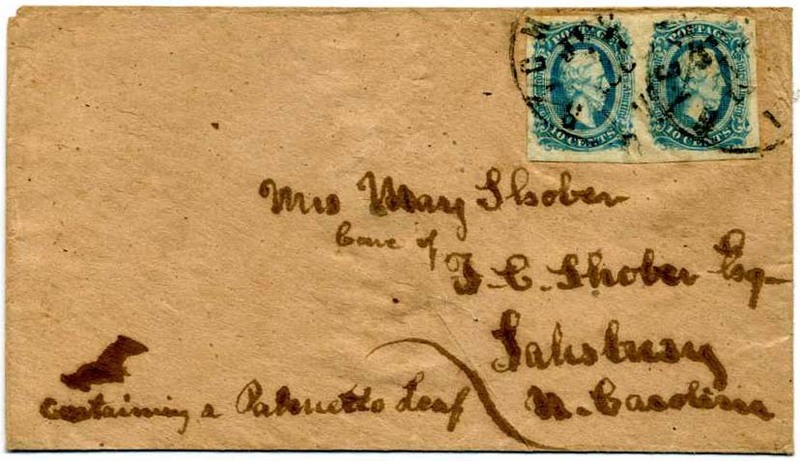 Mary Shober Care of T. C. Shober Esq, Salisbury N. Carolina” with charming matching note at bottom left “containing a Palmetto Leaf” which no doubt accounts for the double rate, minor flap faults, Very Fine. 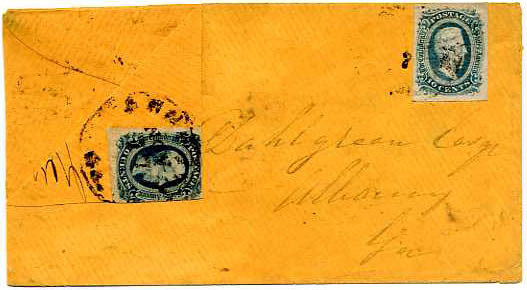 CSA 7, 5¢ blue pair (filled in frame printing variety on right edge of right stamp) tied bold HALIFAX C.H. / VA // JUN / 8 cds on pristine turned cover addressed to “Mr. 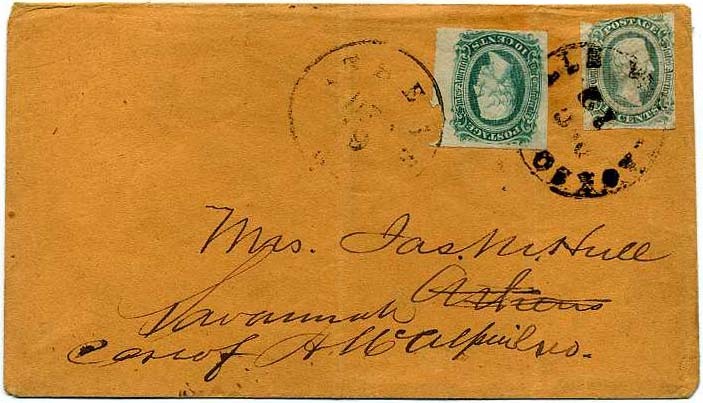 Nath(an) T. Green, Care of Major C. S. Covington, Richmond, Va.”; inside use franked with 4-margin 10¢ light blue #11 (AD) tied blue RALEIGH / N.C. double circle cancel addressed to Mrs. Covington in Halifax. Although, military records (inclosed) checked do not show him with rank past private, such records are frequently incomplete. He was mustered into Co A Va 3rd Cavalry in 1861 and transferred into H Co. Va 14th Infantry in 1864. 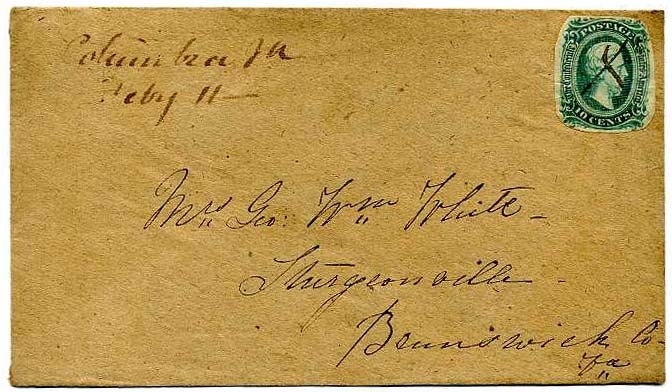 Included records show him wounded at Chester Station, VA and hospitalized at Chimborazo, Richmond, VA. Nathaniel Terry Green enlisted as a private and was detailed April 15, 1862 to Richmond as unfit for field duty due to poor health. Born in Halifax County, VA. A lovely use. 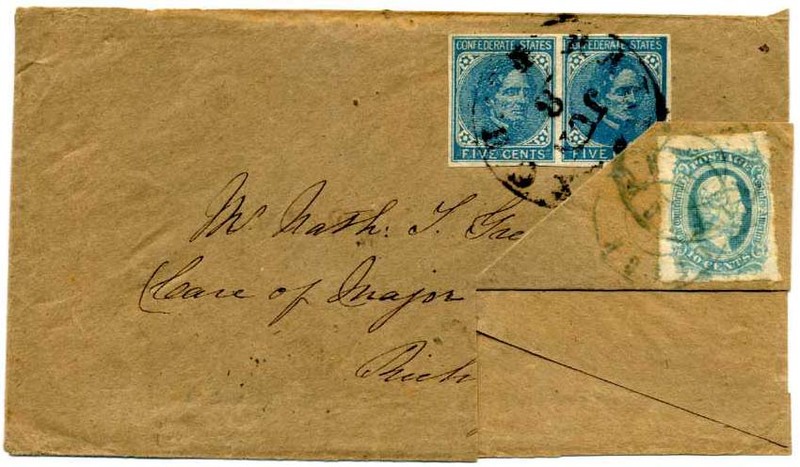 CSA 11, 10¢ blue (4 large margins) tied MOCKSVILLE / N.C. // NOV / 30 cds on homemade cover to “Mr. J. W. Walker, Wilmington NC in the care of Cap blackmer Co 66 Reg” with further routing at lower left which is hard to make out other than “in regt”. Capt. E. G. Blackmer was the Captain of Company G of Lenoir County. John W. Walker is listed as a 2nd Lieut in that company. CSA 11, 10¢ blue tied RICHMOND / Va. // DEC / 20 cds as well as indistinct cds of LIBERTY / Va. / DEC X2. (overlays perfectly with reference of that cds). 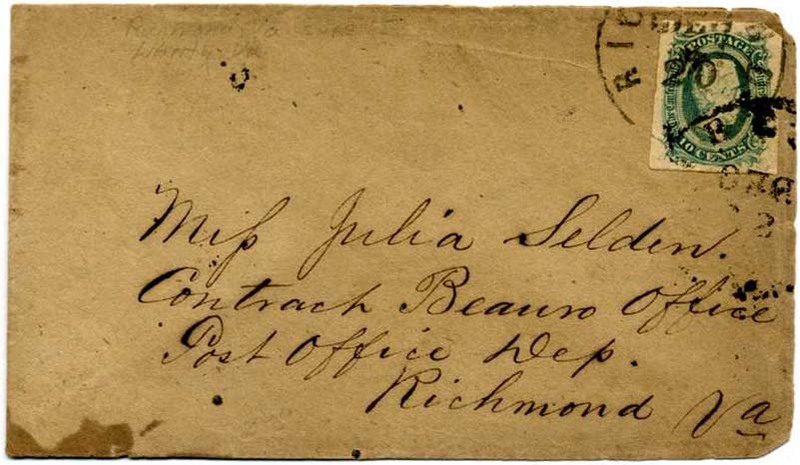 It is addressed to “Miss Julia Selden, Contract Beauro (sic) Office, Post Office Dep., Richmond, Va” which makes it an overpaid drop and possibly misdirected to Liberty and back to Richmond without other postage as is to the P.O. Department. Or it could be that it is a Dec 12, not Dec 22 cds and originated in Liberty. Speculative scenario, but an interesting piece. $150. CSA 11-ADc, 10¢ greenish blue (4 huge margins all around) tied by CHATTANOOGA / Ten. 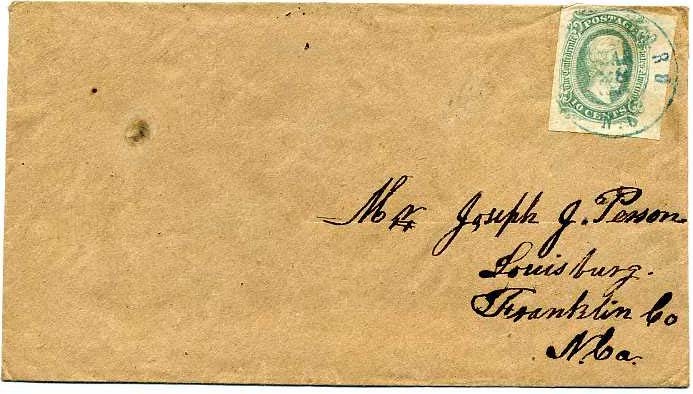 // OCT / 29 (1863) cds used as Army of Tennessee field cancel, upper right corner of cover restored and part flap missing. 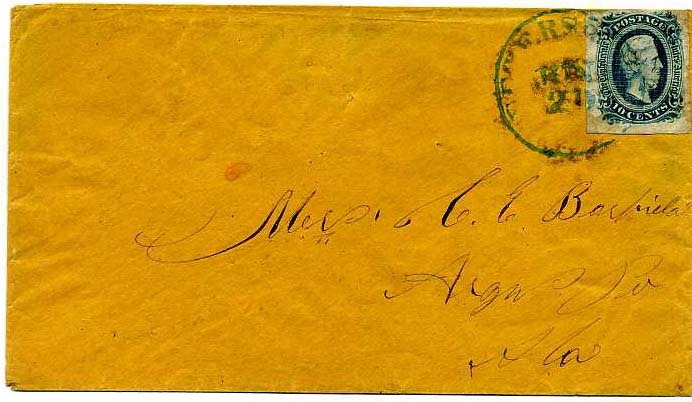 Local canceling device used as a field cancel from September 8, 1863 until January 24, 1864 – a very short period of time. Ex Warren. $180. 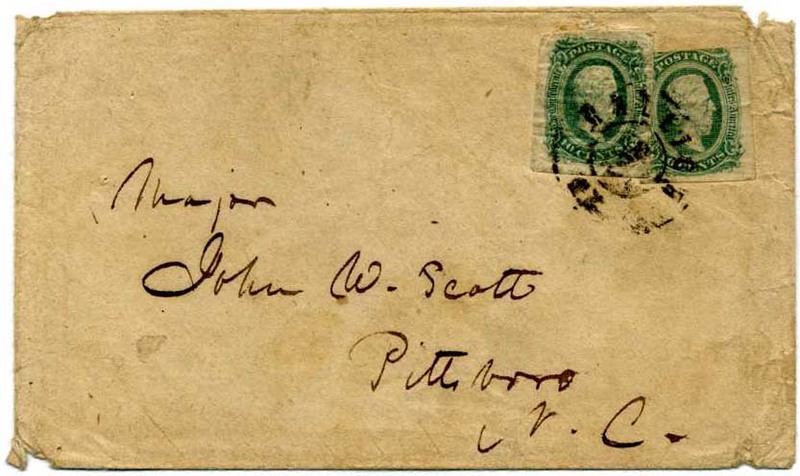 CSA 11-ADc, 10¢ greenish blue, two overlapping copies tied together by RALEIGH / N.C. cds on homemade cover to “Major John W. Scott, Pittsboro N.C.” Nice double use, presumably overweight contents. More than one John W. Scott commissioned from NC thus not sure which one this might be. $200. 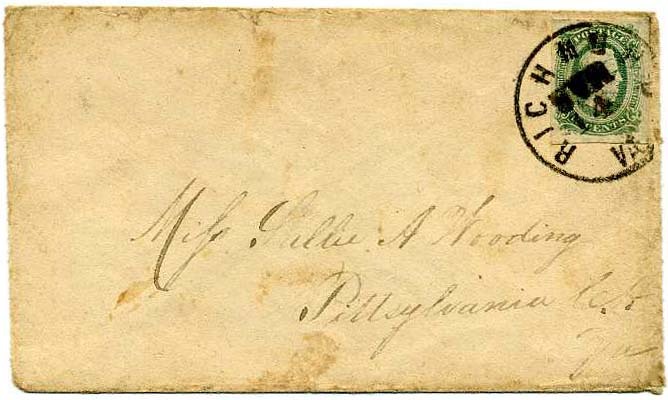 CSA 11a, 10¢ milky blue (4 margins) tied CHARLESTON / S.C. // AUG 11 double circle cancel on part of a folded letter – presents as a full cover but only partial flaps present and letter not really readable. 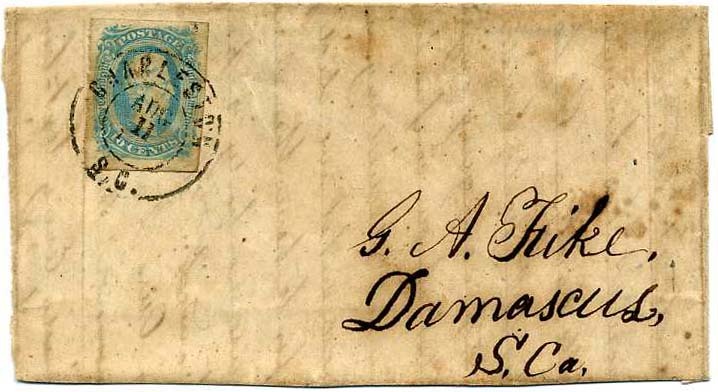 Addressed to G. A. Fike, Damascus, S.C. Beautiful stamp shade. $200. 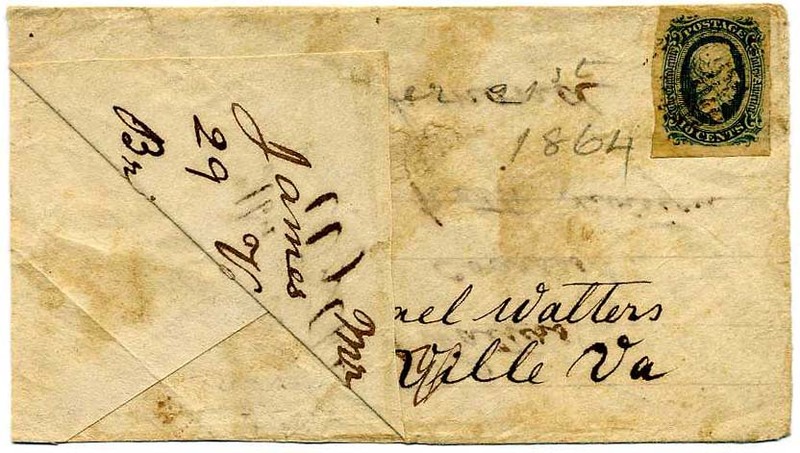 CSA 11, 10¢ dark blue (4 margins, pre-use crease) tied Army of Northern Virginia grid with penciled December 21st 1864 at left on turned cover to Michael Walters, Wytheville, Va.; inside use missing stamp which had been cancel with Wytheville, Va. Dec 7 cds to James A. Walters 29th Va. Reg Coarses (sic – Corse’s) Brigade Pickett's Division, Richmond; open 3 ½ sides. Walters mustered into Co I of Va 29th on 4-10-62 at Russell Va as a Private. He was born in 1835 and living in Wythe in 1897. $150. 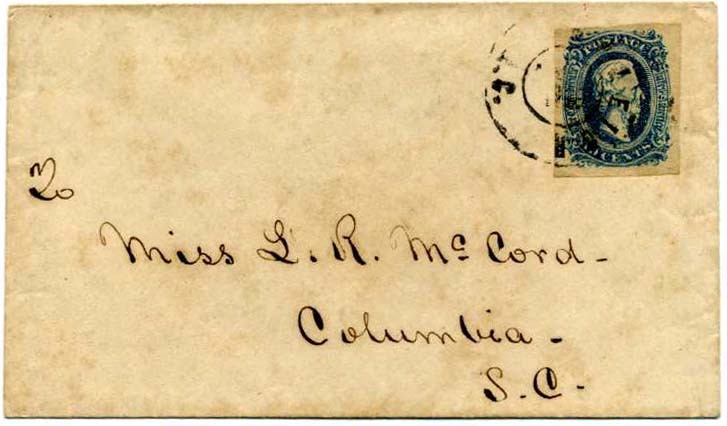 CSA 11, 10¢ light blue (4 margins) tied mostly indistinct S.C. // MAR / 31 / 186_ on homemade cover to W. W. Culler, Care of Maj. G. B. Lartigue, Charleston, So Carolina. Lartigue was a Major with the Confederate Commissary Department to Brig. Gen. Johnson Hagood - shown as Captain and Assistant Q.M. in 1st S.C. Volunteers in July 1862. W. W. Culler was a Private in Co. B of 25th SC Infantry. $170. 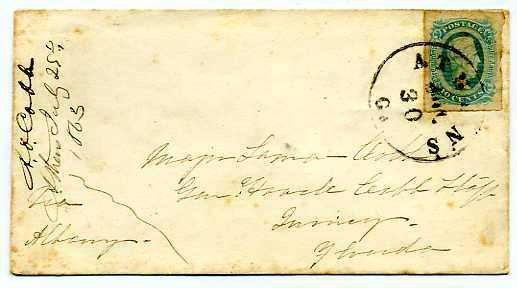 CSA 11, 10¢ blue approaching milky shade, artistically cut to oval medallion, tied light KINSTON / N.C. cds on clean commercially made cover to Miss Nancy Powell, Little Rockfish PO, Cumberland County, N.C., pencil description on verso from Van Dyk MacBride. $160. 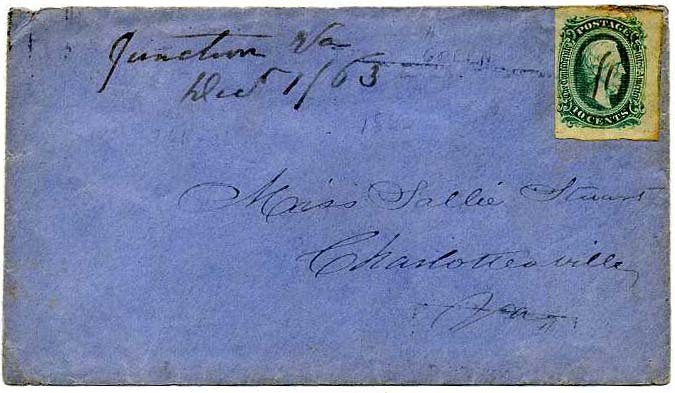 CSA 11, 10¢ blue tied neat bold CHARLESTON / S.C. // MAR / 3 / 186 cds on tiny folded letter addressed to Dr. R. F. W. Allston, Georgetown, So. Ca. 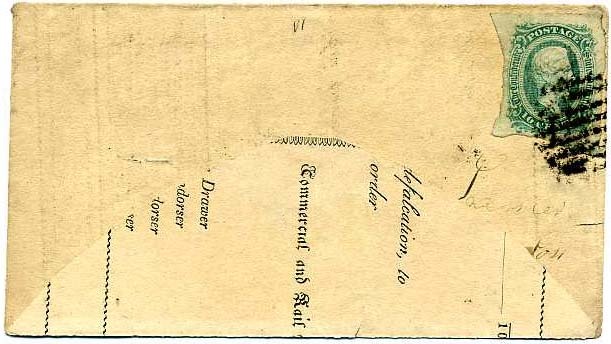 The folded letter has been exploded contemporaneously and used as note paper. Somewhat weak at the folds. 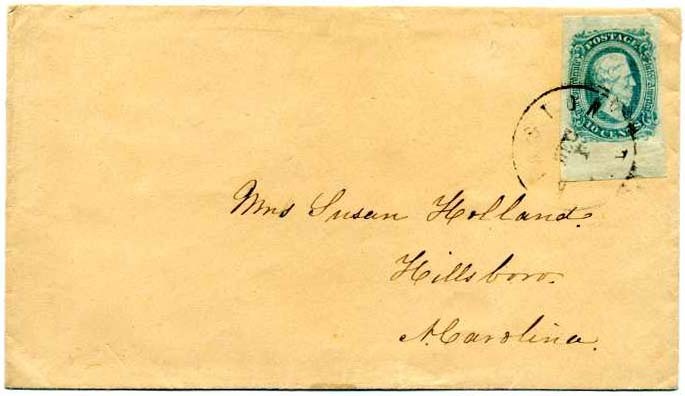 The inside is a business letter discussing Confederate bonds and mentions “the usual shelling going” and is signed Robertson Blackrock & Co. by Geo. W. Moody (blockaders). 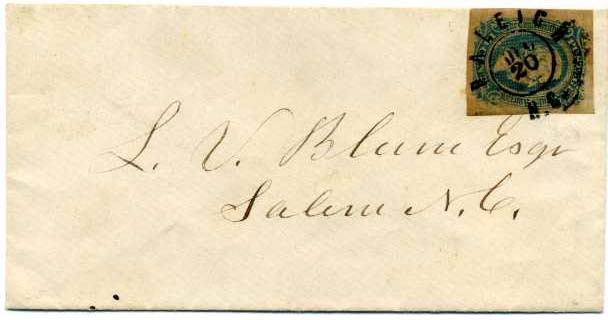 On the face is a fascinating numbered list written over the address side which mentions many Confederate officers by name. Mentions Cat Island, Capt. McCrady, Lieut. Webb…”went to hospital…sent to Georgetown thence…sent up in a cart to [CSS] Chicora where he was attended by Dr. Sparkman & never got out of his bed – was frequently out of his head” Chicora was an ironclad actively employed in the fighting around Charleston during 1863 and 1864. $300. CSA 11c, 10¢ greenish blue (4 margins) with neat strike SAVANNAH Ga. 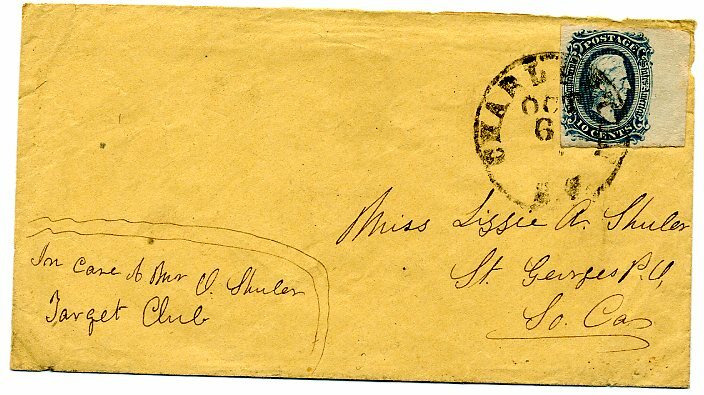 Paid cds partially struck off small homemade cover to Miss Laura A. Walton, Augusta, Georgia $160. 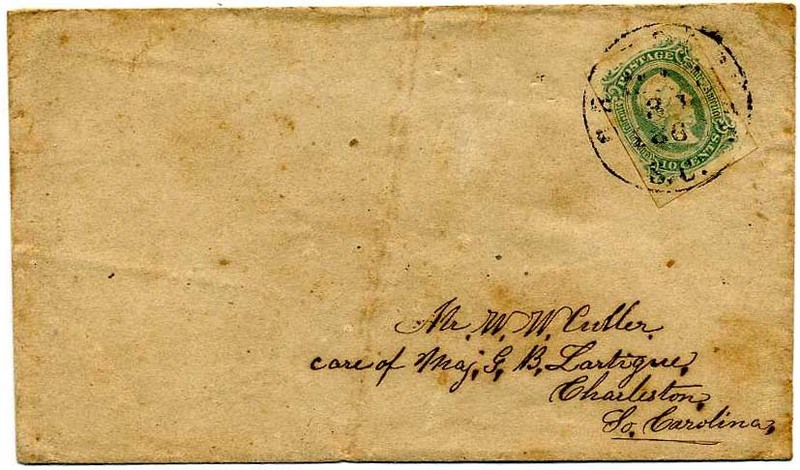 CSA 11c, 10¢ bluish green (4 margins) tied neat VICTORIA Tex. // SEP / 30 cds on cover to Mr. I. Camel, Seguin, Guadalupe County, Texas; slightly reduced at right. Scarce. $325. 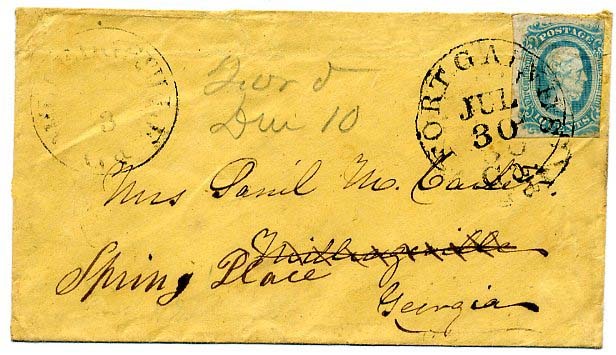 CSA 11a, 10¢ milky blue (4-margin) tied back flaps of cover by TALLAHASSEE / FLA // OCT cds with wonderful military address, “Capt. Junius L. Taylor, Co. K, 5th Florida Regiment, Perry’s Brigade, Anderson’s Division, A. P. Hill’s Crops, Richmond, Va.” Ex Henry Hensel. $250. Junius L. Taylor served in Co. K, Florida 5th Infantry where he served as Assistant Quarter Master. Much more information on linked page.